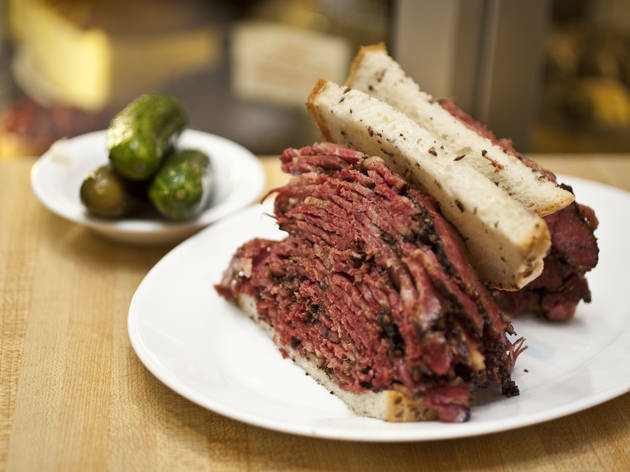 TONY’s tracking the rise of pastrami, from its humble beginnings at a Lower East Side deli to its infiltration of the hippest menus in New York. 1887 Sussman Volk&rsquo;s Delicatessen opens According to many accounts, Lithuanian Jewish butcher Sussman Volk&mdash;who owned a now-shuttered deli at 88 Delancey Street&mdash;was the first to put the sliced meat between two pieces of rye, serving the dish a year after the place opened. Photograph: Virginia Rollison1888 Katz&rsquo;s Delicatessen opensFor more than 125 years, the Lower East Side institution has used the same recipe to make one of the most revered&mdash;and time-intensive&mdash;pastramis around. In a nearly one-month process, navel-cut beef is cured, smoked, boiled and steamed. 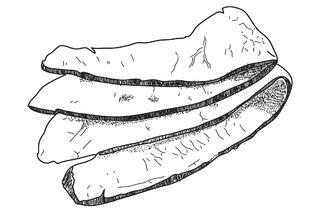 The marbled meat is sliced to order and piled to jaw-stretching heights between rye slices. Photograph: Virginia Rollison1937 Stage and Carnegie Delicatessens openOnly a block apart on Seventh Avenue, the time-honored Stage and Carnegie Delicatessens competed for famous patrons, like Joe DiMaggio and Mel Brooks, and for the reputation of the city&rsquo;s best pastrami. As the pair one-upped each other, their sandwiches ballooned to monstrous size, each weighing in at more than one pound. 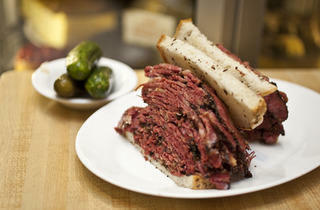 Stage Deli closed its doors in 2012, but Carnegie is still smoking, steaming and slicing. 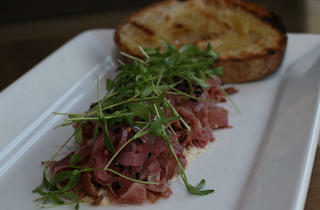 Photograph: Talia SimhiSeptember 2008 Lamb pastrami debuts at Char No. 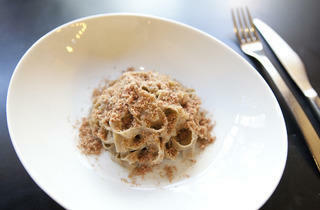 4Chef Matt Greco retooled the classic beef dish using the more outr&eacute; lamb. 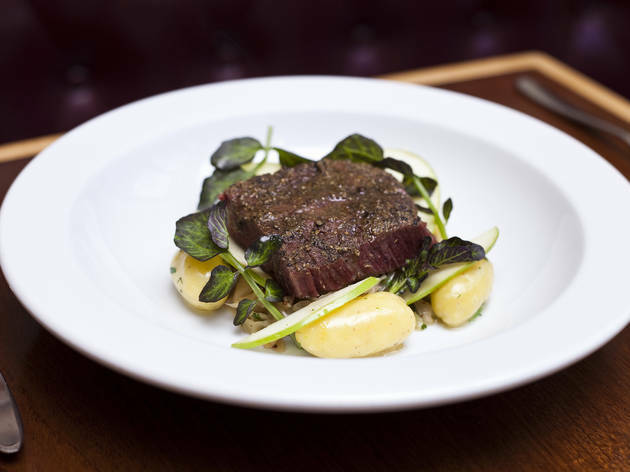 The brined-and-braised mutton is thinly sliced and served with micro-greens, pickled onions, and aioli flavored with traditional pastrami spices of black pepper and coriander. 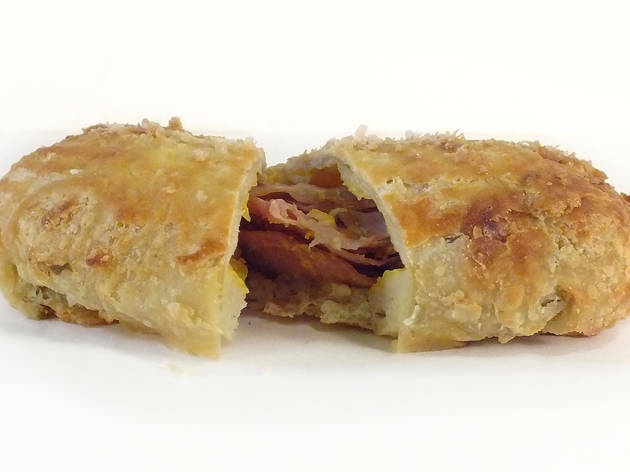 Photograph: Jessica LinAugust 2011 Katz&rsquo;s pastrami egg roll is introduced at RedFarmDim sum maestro Joe Ng worked the deli meat into the Chinese takeout standard to honor owner Ed Schoenfeld, who visited Katz&rsquo;s nearly every week as a child. 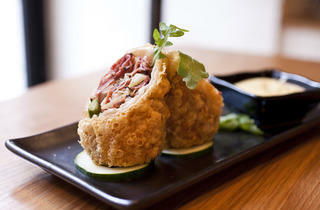 Ng matches the peppery pastrami with saut&eacute;ed asparagus and standard egg-roll stuffings (cabbage, carrots and onion) in the twice-fried snack. 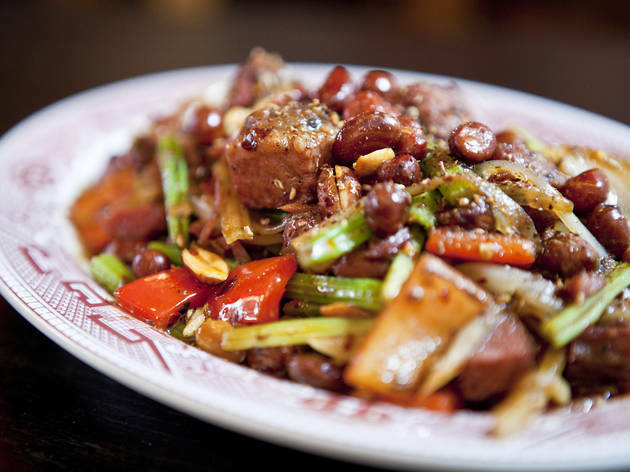 Photograph: Jakob N. LaymanMay 2012 Mission Chinese Food&rsquo;s Kung pao pastrami arrives in NYCA signature of Danny Bowien&rsquo;s San Francisco flagship, this lauded dish came east when Bowien opened his quirky Chinese restaurant in New York. Inspired by BBQ from his hometown of Oklahoma City, Bowien rubs brisket with Szechuan peppercorns and pastrami spices, before smoking it over wood for 12 hours. 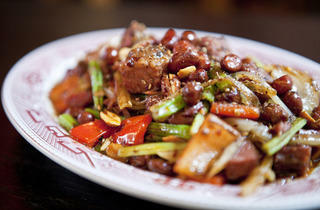 He then wok-fries diced cubes of meat with chilies, peanuts and celery. 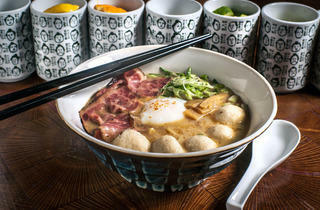 Photograph: Paul WagtouiczAugust 2012 Dassara creates deli ramenInspired by Japan&rsquo;s more creative ramen bowls, co-owner Josh Kaplan turned out this Japanese-Jewish hybrid, combining his Aunt Sherry&rsquo;s matzo balls with Mile End&rsquo;s heavily smoked meat. 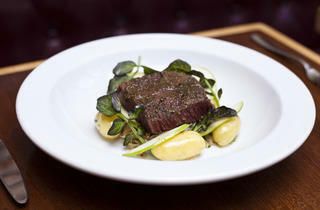 Photograph: Jessica LinDecember 2012 Short-rib pastrami comes to BattersbyAt this Brooklyn charmer, farm-to-table chef Joe Ogrodnek makes his pastrami with Wagyu beef. The meat is served on braised green cabbage, shredded apple and potato, and finished with a mustard dressing to mimic the sandwich&rsquo;s classic condiment. 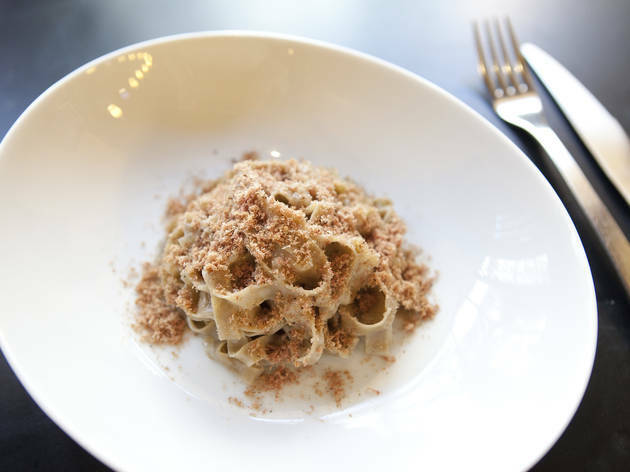 Photograph: Jessica LinMarch 2013 Rye pasta with pastrami debuts at AlderIn an ode to nearby Katz&rsquo;s, chef Jon Bignelli prepares pastrami two ways&mdash;slow-cooked and dried jerky-style&mdash;at Wylie Dufresne&rsquo;s downtown hot spot. Bignelli dips caraway-rye pasta in a mustard-beef-stock sauce and drapes it atop tender slices of brined and smoked brisket. 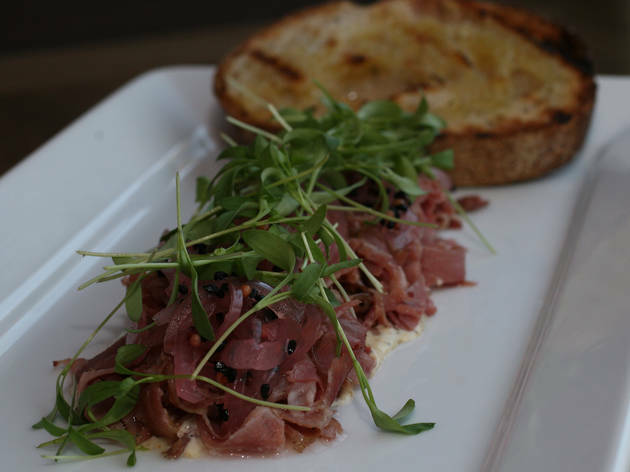 The dish is finished with shaved pastrami jerky and a pickled tomato, a nod to the original&rsquo;s accoutrement of tangy deli pickles. 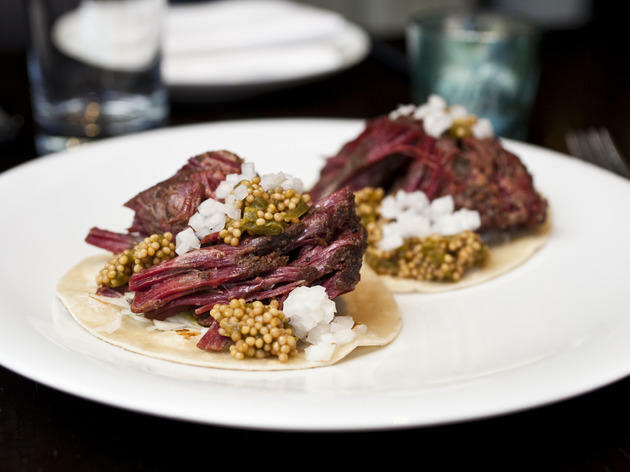 Photograph: Jessica LinMarch 2013 Short-rib pastrami tacos appear at Empell&oacute;n Cocina and Empell&oacute;n TaqueriaHaute Mexican booster Alex Stupak smokes and slow-cooks short ribs for this South of the Border makeover. 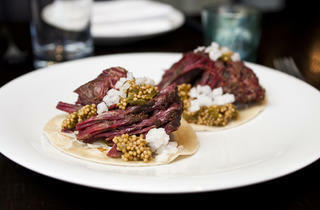 The tender pastrami is cradled in a flour tortilla with pickled cabbage, mustard seeds and jalape&ntilde;o salsa. 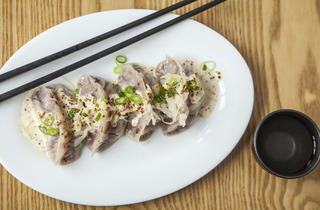 Photograph: Erica GannettJuly 2013 Pastrami dumplings are introduced at Brooklyn Wok ShopChinese-American chef Edric Har stuffs dumplings with house-made pastrami. 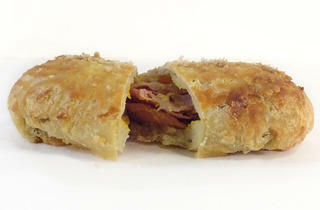 To mimic classic deli trimmings, he serves the Jewish-Chinese pockets with sauerkraut, Dijon mayo and slivered scallions. 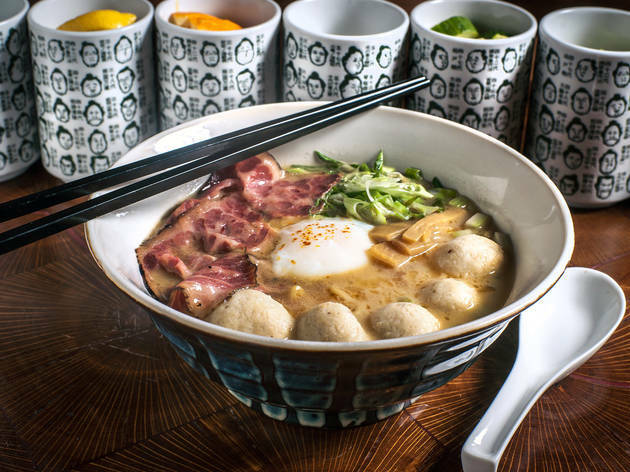 Photograph: Erica GannettAugust 2013 Shalom Japan stuffs chicken with pastramiTaking cues from fung wong gai&mdash;a Cantonese chicken-and-ham dish&mdash;husband-and-wife team Aaron Israel and Sawako Okochi create their own playful combo. 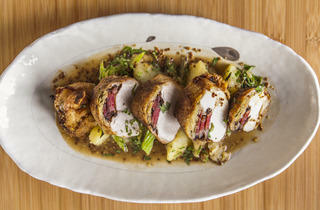 The duo layers chicken breast with pastrami and saut&eacute;ed cabbage, before rolling and searing the roulade. 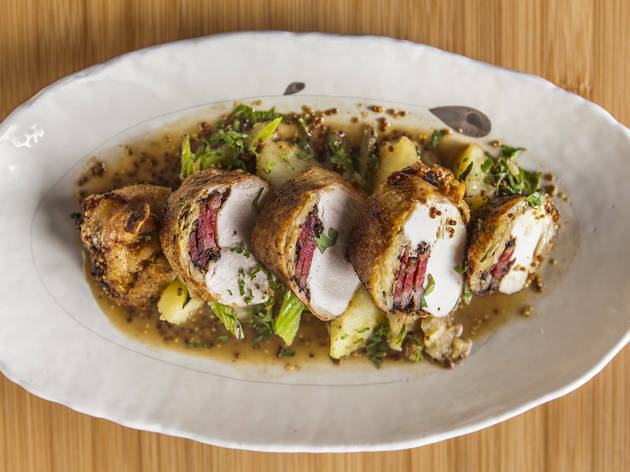 The juicy chick-strami is served with potato salad, charred celery and a mustard-chicken jus. 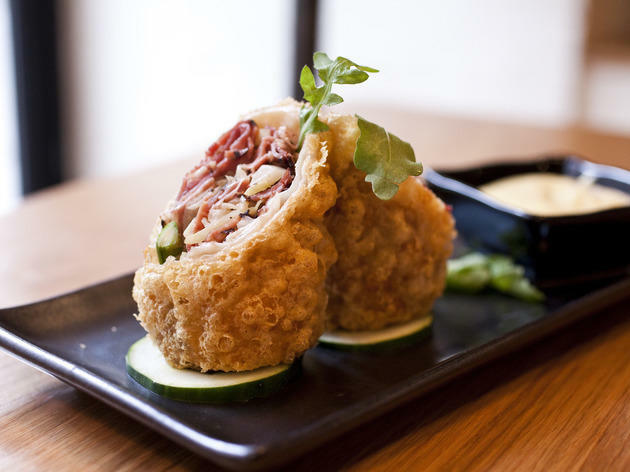 Photograph: Courtesy Milk BarFebruary 2014 Rye-and-pastrami pocket returns to Momofuku Milk BarMaster pastry remixer Christina Tosi put her fiendish spin on the deli sandwich, reworking it as a turnover in August 2013. She slathers buttery croissant dough with compound caraway-rye butter and folds it around pastrami, sauerkraut and Russian dressing. The rich package&mdash;which makes its comeback on February 1&mdash;is baked until bubbling. 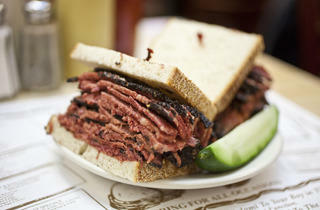 Pastrami—the king of Gotham’s deli meats—is quintessential New York. 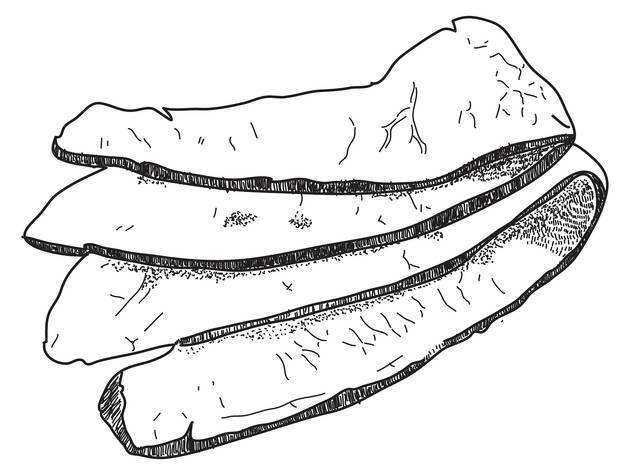 Originally a wind-dried beef, it came about in the prerefrigeration era, when salting was used as a preservation technique. When it arrived in town with Romanian Jews in the late 1800s, it went through what many émigrés did: a little reinvention. 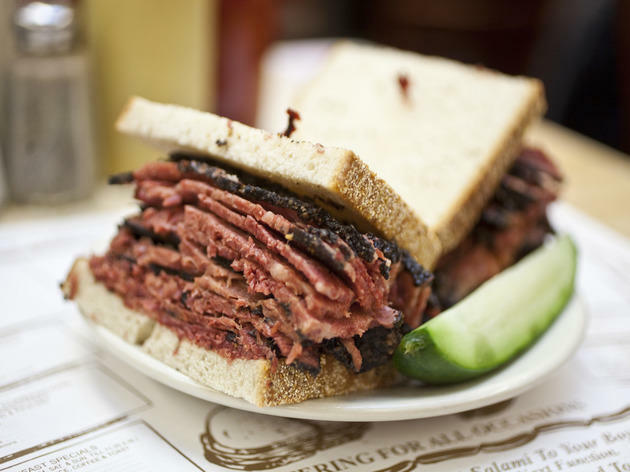 Smoking and steaming were folded into the process, and soon delicatessen owners were stuffing the meat between slices of rye, creating the hefty lunchtime classic we know today. 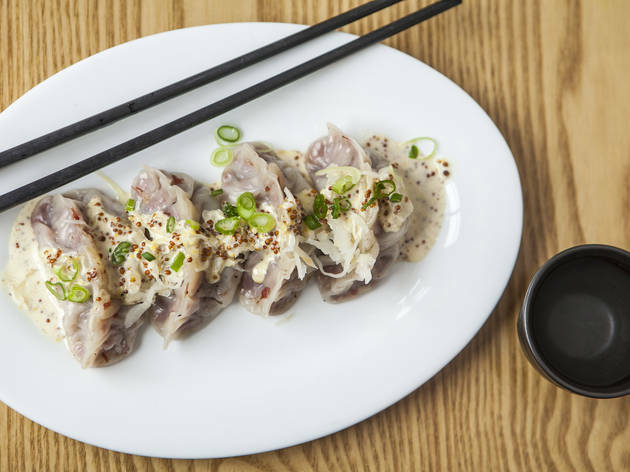 In the past few years, the deli meat has played muse for inventive chefs like Danny Bowien and Wylie Dufresne, who have popped off reimaginings in rapid fire. We track the evolution of this New York original as it breaks out of the “on rye” mold.